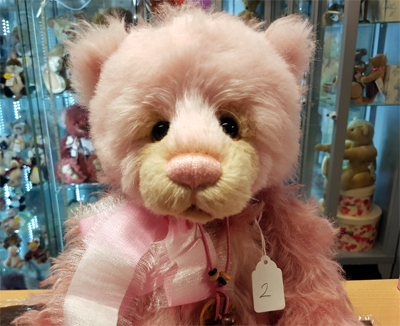 Gladrags can stand on her own two paws like other members of her bear family and is Blancmange’s older sister, other family members include Pumpernickel and Gorgonzola. Just like them she has been created using the softest mohair and alpaca which feels gorgeous when held. Tones of pink feature in the fabrics from a delicate ballet shoe pink to a more vibrant salmon colour which naturally add high and low lights to her fur. she does have both flat paw pads enabling her to stand but also sculptured pads to her arm paws. She has a very gentle expression and is perfect when it comes to Bear therapy sessions.